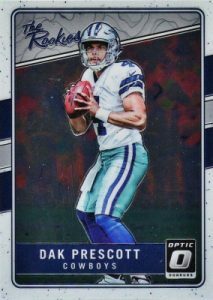 Applying Opti-Chrome technology to the base Donruss Football design, 2016 Donruss Optic Football offers a new option for the gridiron. Hobby boxes average one autograph. Featuring both the standard cards and the popular Rated Rookie (1:2 packs) subset in chromium, the base set is further amplified with quite a few parallels. 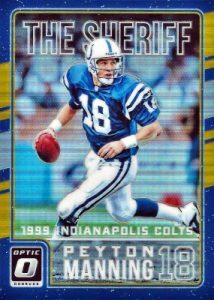 This includes Holo, Aqua (#/299), Orange (#/199), Blue (#/149), Red (#/99), Carolina Blue (#/50), Black (#/25), Gold (#/10), Green (#/5) and Gold Vinyl (1/1). 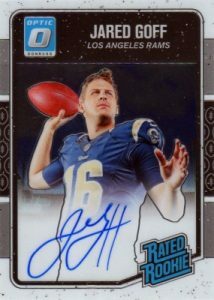 Bringing the first-year players to the forefront, 2016 Donruss Optic Football takes a long look at the '16 rookie class. 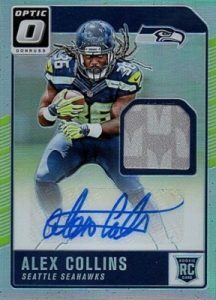 Rated Rookie Autographs are signed on-card for the top names from the draft while Rookie Patch Autographs add a small relic with the sticker signature. 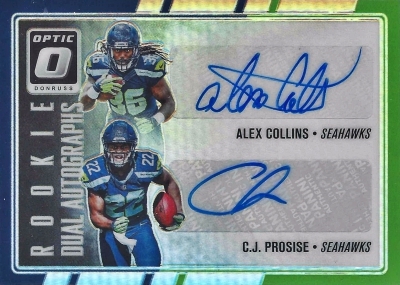 Dual and Triple Rookie Autographs bump the total up a notch with multi-player signature cards. 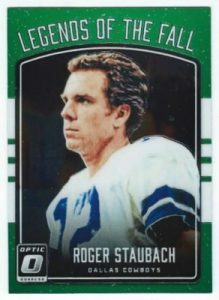 Other signed inserts in 2016 Donruss Optic Football include The Legends Series Autographs for 15 all-time greats of the NFL and Fans of the Game Autographs for celebrity supporters like Daisy Ridley, Megan Fox and Al Pacino. Featuring several per box, basic inserts include some familiar themes from the brand's history. 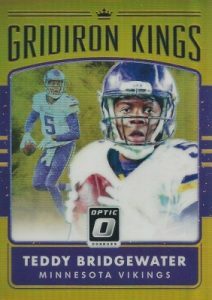 Each falling one per box are Gridiron Kings, Legends of the Fall and The Rookies. 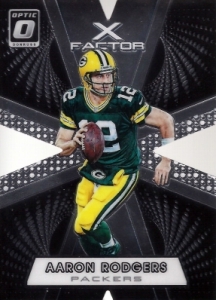 Prototypes also average one per box and are joined by X-Factor die-cuts celebrating 20 of the top current players. BASE PARALLEL CARDS: Holo, Aqua #/299, Orange #/199, Blue #/149, Red #/99, Carolina Blue #/50, Black #/25, Gold #/10, Green #/5, Gold Vinyl 1/1. ROOKIES & RATED ROOKIES PARALLEL CARDS: Bronze, Holo, Pink, Purple (retail), Red and Yellow, Aqua #/299, Orange #/199, Blue #/149, Red #/99, Carolina Blue #/50, Black #/25, Gold #/10, Green #/5, Gold Vinyl 1/1. 31 cards. Serial Numbered #/150. *Cards found only in parallels noted below. PARALLEL CARDS: Bronze, Holo #/99, Blue #/75, Red #/50, Black #/25, Gold #/10, Green #/5, Gold Vinyl 1/1. 47 cards. Serial Numbered #/150. *Cards found only in parallels noted below. PARALLEL CARDS: Bronze, Holo #/99, Blue #/75 (*No card #175), Red #/50, Black #/25, Gold #/10, Green #/5, Gold Vinyl 1/1. 20 cards. Serial Numbered #/100 (*Cards #15, 20 - #/50). PARALLEL CARDS: Blue and Green, Bronze, Pink, Prime #/25 (*Card #5 - #/10). PARALLEL CARDS: Blue and Green, Bronze, Pink, Prime #/50. PARALLEL CARDS: Blue #/149, Red #/99, Gold #/10, Green #/5, Autographs #/5, Autographs Gold Vinyl 1/1, Gold Vinyl 1/1. PARALLEL CARDS: Blue #/249, Red #/99, Gold #/10, Green #/5, Gold Vinyl 1/1. Looking forward to this product. One question though. Will this product feature hot boxes like baseball? And by that I mean, will there be color boxes with a colored insert/card in every pack? Or auto hot boxes? 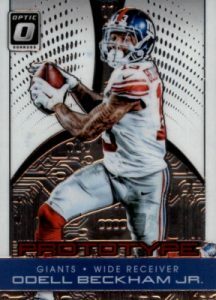 This might be the new topps football chrome. I certainly hope so. Does anybody know how big the set will be? Will it be a shortened set or the same as the original Donruss? If so, it’s going to be pricey to build. Looks like they really missed the mark here. I expect the price of a box to drop to nearly $40. 1 autograph for $90+? To assume basic cards/inserts in Donruss collection are worth that price are unlikely. 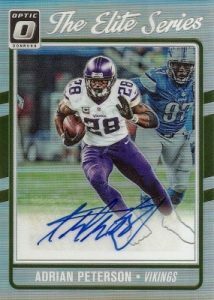 Supreme or Prime Signatures offers a better value per major hit and a better quality of card at half the price. I ripped 1 box that was a hot box so I grabbed another one that yielded a red refractor Paxton Lynch on card auto #’d/50. I grabbed one more to bust at home which was another hot box. 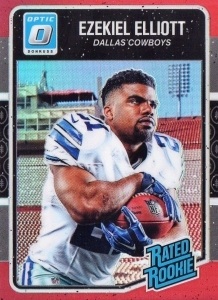 I also pulled 3 Zeke’s in the first box (1 base RC, 1 refractor RC & 1 “The Rookies” insert). No Dak or Goff base RCs, but pulled just about all of the others. Of the 9 autos 5 were on card (1 being a Rated Rookie redemption that should be #’d/150). 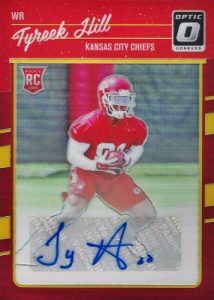 It looks like the Rookie Signatures are sticker autos (#’s 101-150) while the Rated Rookie autos are on card (#’s 151-200). Lots of refractors too. I have to give it 5 stars based on my break. This is not a $100 a box product,a few people nation wide get a hot box and the price goes to the moon. The cards are average at best. This stuff has been pretty solid for me with decent auto pulls, good RCs (usually a Zeke or Dak each trip to the LCS), and some nice #’d parallels. It has the same look and feel as chrome football – my previous favorite. I agree that $100+ is still pretty high – especially if you get bad luck on your auto, and miss on the Zeke/Dak Rcs. I probably won’t start really getting into until it gets down to $75 or less, or the $20 boxes pop up at WalMart. I got a hobby box with 4 autos in it, including a /20 Christian Hackenburg jersey auto, I also got many other numbered cards. Very good box, I may have to get another. No rating. The cards look great, but I have not bought any. Why not? 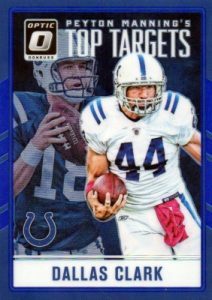 Because I still have unfulfilled redemptions from 2013 sitting in my Panini account, and I have received no answers from Panini to my numerous emails. If anyone from Panini is reading this, you have lost 1 customer. Confused about the ‘Inducted’ Set. I have the blue Numbered out of 149 and a green numbered out of 5. Not in the description. Any thoughts? Great Product!! Collecting the “rainbow” is fun. The only thing is I think the AQUA holo refractor is by far the nicest looking of all the parallels in the base set and should have been #’d lower than /299. The PINK holo is #2 best looking parallel and its not even #’d! And you can only fnd it in retail. 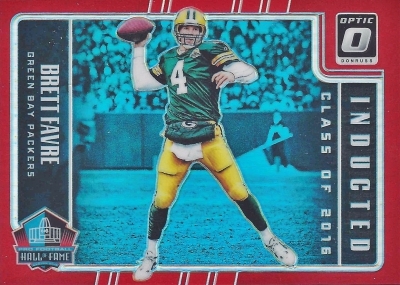 believe me, I would love to give product a 5 star grade, but nearly every box I cracked, the centering was ATTROCIOUS for a premium,modern day product. 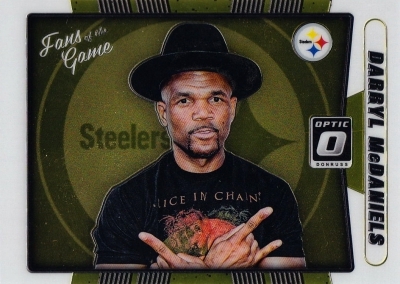 Whoever did the photoshopping or card cutting was intoxicated or something. Look at the bordering, if its decent in front…its 70/30 on back & vice versa…at least the boxes I cracked. maybe I was just into a bad batch…..like to know if others have this issue?? ?